South Sudan’s banks should be apolitical engines of the South Sudanese economy, catalyzing business investment. Instead, some of these banks are corrupted institutions used by the political elite to transfer ill-gotten gains abroad at the expense of providing capital and facilitating trade for the millions of South Sudanese suffering from five years of war. Many powerful South Sudanese elite—known as Politically Exposed Persons (PEPs) in banking terminology—their relatives, and their associates exploit privileged access to bank services or control banks outright. The war economy, built on PEPs’ control of banks and capture of oil profits, benefits the elites even as most South Sudanese suffer the devastating consequences of persistent inflation. While banks can be channels of corruption, South Sudan’s peace, development, and economic future also depend on local banks and, through correspondent banks, the global financial system. Without reforms, however, there is little chance international donors, banks, and investors will trust the country’s banking system enough to finance South Sudan’s peace and stability. The next step for peace-focused policymakers—the coalition of regional mediators, local civil society, and international supporters of the peace process—is to dialogue with banks and position them to support South Sudan’s economy. Politics and Banks Intersect. 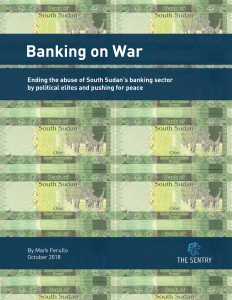 More than half the 26 banks operating in South Sudan, a total of 14 banks, are partially owned or controlled by a PEP, suggesting an undue level of political influence in the banking sector. A mix of local banks, joint banks co-owned with East African investors, and foreign banks operate in the war-torn market but offer few banking services. PEP Control of Banks Hurts Most South Sudanese. Because PEPs establish and control banks—either directly or through relatives and associates—these banks receive preferential access to foreign exchange. This corrupt practice has caused inflation as PEPs have moved hard currency out of the South Sudanese economy. PEPs Rely on the Global Financial System. South Sudanese banks operating within East Africa’s banking network have access to the global financial market through correspondent bank relationships. Many of the powerful political elites who are driving the war rely on correspondent banks in the region and in banking capitals around the world to move money, including U.S. dollars. Misuse Threatens All Banking in Juba. Regulatory, reputational, political, and money laundering risks in South Sudan’s PEP-influenced banking sector could lead South Sudanese banks—and potentially other East African banks—to lose connections to the global financial system and decrease economic opportunity for millions of South Sudanese. International banks, policymakers, and others committed to peace, good governance, and development in South Sudan must find joint solutions to the deficiencies in East Africa’s correspondent banking network, address regulatory and compliance gaps, and correct PEP influence in South Sudan’s banking sector to set the country on the right economic course. Strategic De-Risking. Given the heavy PEP influence on South Sudan’s banking sector, there is a risk that local banks will be cut off from the global financial system. To prevent large-scale de-risking and restore international confidence in the banking sector, correspondent banks and regulators should agree to remove the most politically influenced local banks from the global financial system. PEP-Focused Bank Regulations. To lower the chances of heavy-handed de-risking, a regulatory strategy pinpointing how South Sudanese PEPs and their relatives infiltrate East Africa’s banking sector could kick off transparency and bank reforms. A risk-based strategy could home in on specific individuals, rather than focusing simply on the size of transactions. Diplomacy and Banks. To support necessary reforms, a partnership between international banks and those pressing for peace and good governance could align the goals of facilitating peace and improving the banking sector in East Africa. A new economy must be assembled in South Sudan to ensure that local banks are the apolitical engines of growth instead of vehicles of corruption.